I have to admit that one of the tasks paralyzing me has been the creation of foundation walls for my greenhouse. Despite the wonderful worksop Ron Hoess gave us on the construction and weathering of walls, I never got further than buying supplies and looking at Ron’s technique over and over. I finally figured out that what was stopping me was the freehand drawing of the stone shapes. I came up with a solution that made my job possible. Here are the steps I took. I have six more of these walls to do but this one was the hardest so I am ready to tackle the others. 1. I bought a plastic wall and trimmed it to fit my wall sizes. I couldn’t use the plastic wall as it was because stones would get cut in half and it would look odd. So I had to build my own wall with the height and width I needed. 2. I bought excessive supplies and stared at them for weeks. I had Paperclay, Sculptamold, and something called Celluclay. 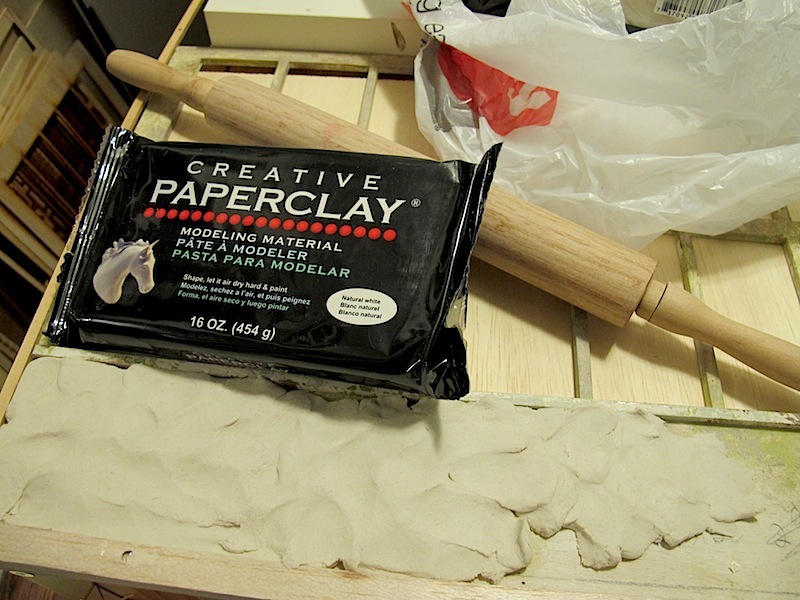 I chose the Paperclay simply because it was already mixed and I wasn’t in the mood for a mess. 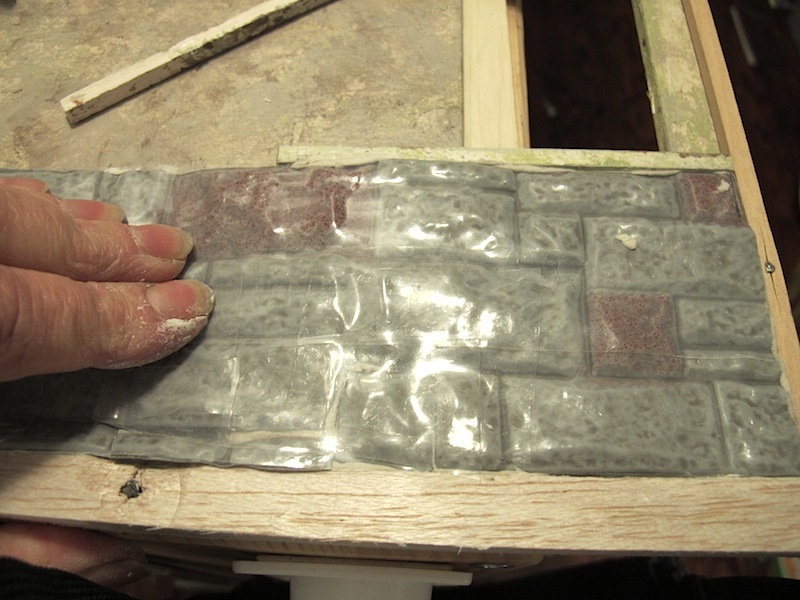 I pressed the Paperclay into the shape I needed, adding temporary framing to keep it in shape with straight edges. I didn’t need the roller because it looked better if I pressed it in place with my fingers. It gave a rougher surface. 3. 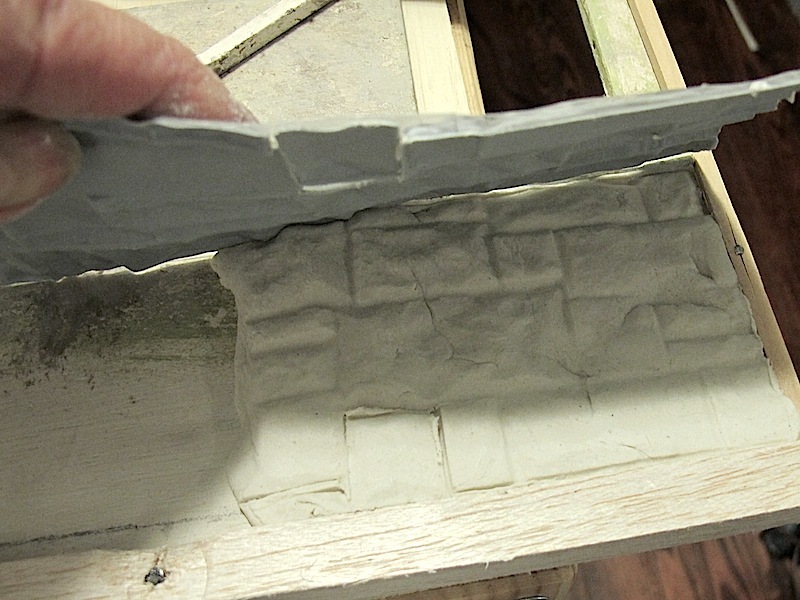 I pressed the wall mold, which I had taped together, firmly into the Paperclay and then removed it. It left nice stone shapes that are better than I could ever do and it gave the stones a nice surface too. 4. I used a straight tool to scribe the lines between the stones to define them. 5. 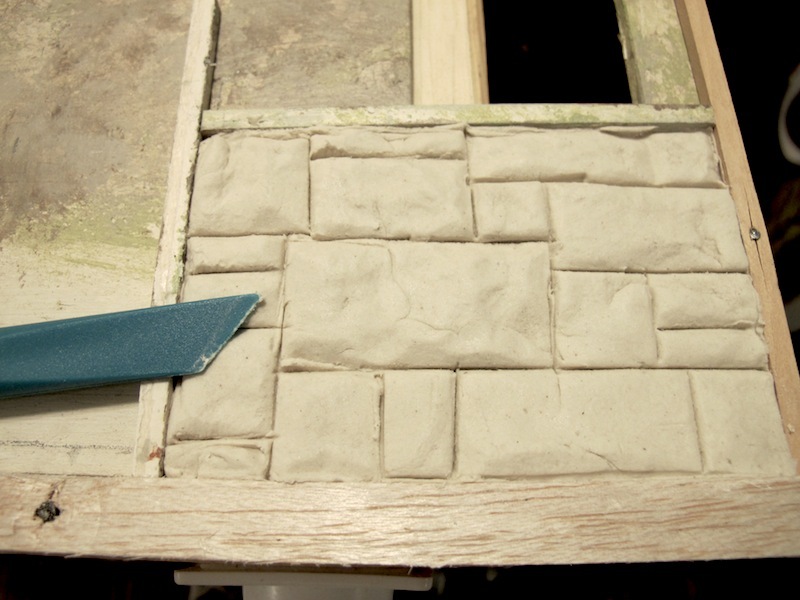 Then I used a rounded tool to soften those lines to look like mortar between the stones. 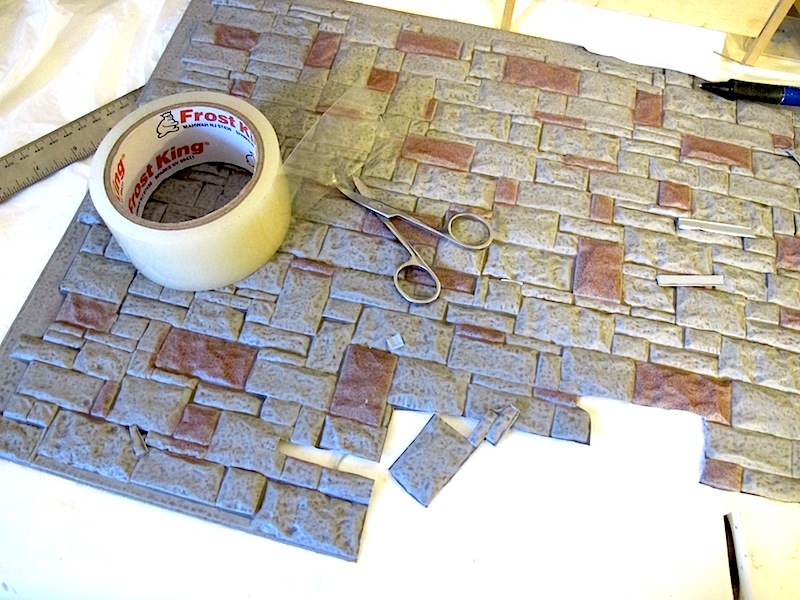 I also used the soft tool to make the corners of the stone looked cut and not too sharp. 6. My wall had to be made in pieces because other walls and accessories intersected it. 7. I tested the fit of a fireplace and the other walls and then removed them and the temporary framing and put the wall aside to dry. 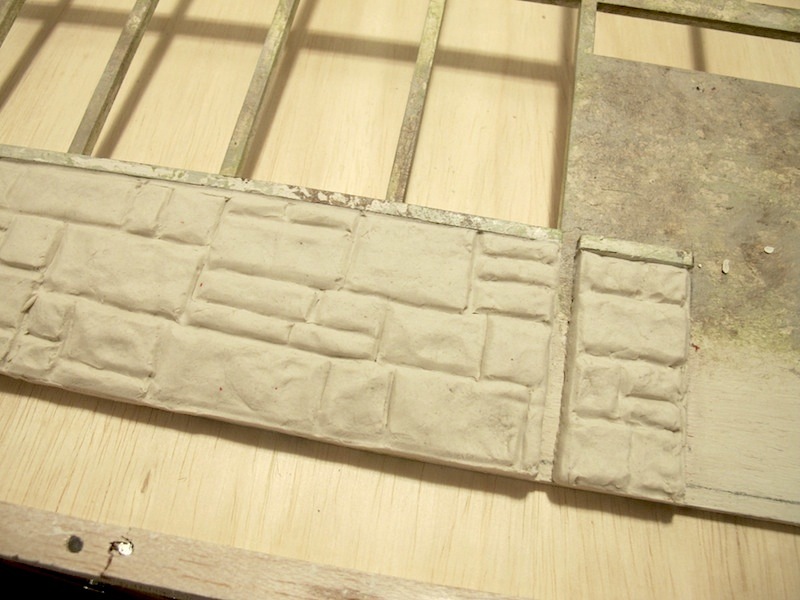 The Paperclay walls need to be glued in place after they dry and they need to be painted and aged.